Audi Downtown Toronto. You’re Here. We’re Here. As the manufacturer of some of the world’s most stylish, luxurious and desirable vehicles, can Audi really be cost-effective as a fleet supplier? If you think the answer is no, take a closer look. You will be pleasantly surprised. We offer a wide range of vehicles that combine exceptional performance with remarkably low fuel consumption and CO2 emissions. In addition, even our entry-level models feature generous features and options, suited to today’s executive expectations. Reliability and service are another strong point – just ask the recent JD Power survey – and this in turn contributes to excellent residual values. We can offer Purchase & Leasing deals from 2 years to 4 years or more, on every model throughout the extensive range of Audi vehicles. In this fast paced world we live in, isn’t it comforting to know that someone is taking excellent care of you and your executives’ vehicles? Audi Downtown Toronto Fleet utilizes both Corporate and Employee programs to extend benefits to you when purchasing or leasing an Audi. Audi Downtown Toronto’s fleet program offers all the value of fleet pricing, coupled with our unmatched level of executive service. With the Audi Fleet program, companies operating five or more vehicles are entitled to generous benefits when purchasing or leasing their executive’s vehicles. Our Audi Fleet program is designed to address the needs of companies who are seeking executive transportation. To qualify your company must have five vehicles owned and operated in the company name and have a corporate Audi fleet account number. Audi fleet pricing can also be extended to those commercial customers buying three or more business or executive use vehicles at one time. 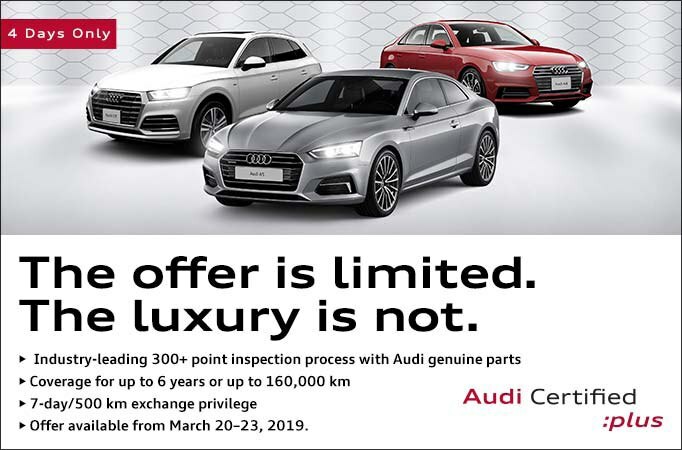 VIPs, executives and upper level management whose company offers five or more car allowances can also take advantage of the Audi Fleet program. Fleet incentives will be extended to those business customers who receive a fixed monthly or yearly allowance specifically for the acquisition or operation of a motor vehicle. We carry an extensive line-up of over 300 Audi’s from sedans, sport coupes, roadsters, suv’s, and more than 75 pre-owned luxury vehicles. We guarantee you will find your ideal Audi in our state of the art facility. Audi Downtown Toronto is dedicated to providing a truly phenomenal sales, service, and parts purchase experience to each and every one of our valued fleet customers. You will find Audi Downtown Toronto to be the premier choice for luxury transportation. You’re here… We’re here. Audi Downtown Toronto.